When did manufacturing industries start embracing the use of 3D models? Automotive, aerospace, shipbuilding – when did each of these sectors start using 3D technology to boost productivity? You might be surprised to find out that the answer is that 3D modelling was used as early as the mid-1980s in most of these manufacturing areas. Our cars, planes, and submarines have started as digitally-rendered models on a computer for a few decades now. So, what about construction? A powerhouse of an industry, consistently erecting the largest man-made structures around the globe… and yet, an industry that has only started standardizing the use of 3D models since the mid-2000s. Twenty years seems like an awfully long time to pick something up, especially in today’s fast-paced global market. The adoption of 3D modelling is just one example. As a whole, the industry is lagging in terms of IT adoption. According the Mc Kinsey digitization index, the construction industry ranks 21st out of 22 industries regarding digitization. The construction sector is also behind in terms of productivity gains. A myriad of reports show that in the last two decades, productivity in construction is lagging when compared to manufacturing. This parallel between slow IT adoption and slow productivity gains is disturbing. Why is this an issue? In a world with an ever-increasing need for high quality and sustainable infrastructure along with an aging workforce, productivity gains become an imperative. What is at stake here is the ability for each country to deliver a high level of quality, sustainable buildings, and infrastructure. Since construction is essentially a domestic business, difficult to trade and outsource as opposed to manufacturing, there is an opportunity for countries to do more with the same workforce, and, in some countries, to become less reliant on foreign workers. 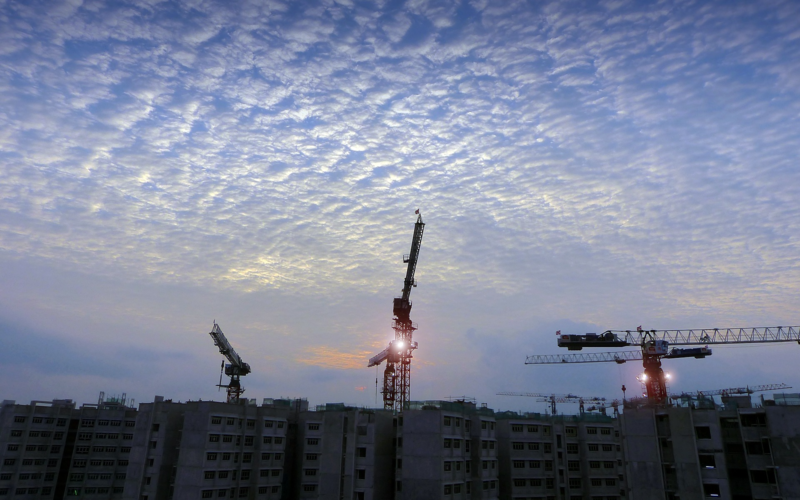 The key reason to this delay is linked to the specific nature of the construction sector: it is a highly fragmented industry, fundamentally centered on projects, and one where various actors operate throughout a project’s life cycle. These characteristics create an environment where the adoption of new standards and new methodologies is constantly challenged with short-term project constraints and the complexity to operate and influence thousands of entities. It is a highly fragmented industry, fundamentally centered on projects, and one where various actors operate throughout a project’s life cycle. Additionally, there are very few large players that can set an industry-wide standard. When you look at an industry such as aerospace, big names like Boeing or Airbus can standardize a new technology throughout the industry by incorporating it in their processes or imposing it to the supply chain. In construction, there is no such landscape. Will the construction industry finally catch up with manufacturing in terms of digitization? BIM makes unconventional architecture possible. Although the adoption of information technology has been slower in construction than in other industries, interest in technology has dramatically increased in the last ten years. The most important trend in this field is Building Information Modelling. BIM is probably the most discussed technology trend in the industry; you simply cannot avoid it. In the last few years, the adoption of BIM has emerged as a practice to improve design quality and coordination. While the benefits of BIM are undeniable, the reality is that its adoption has not impacted the industry as initially forecasted. The adoption has been primarily focused on the design stage, with the adoption of 3D authoring tools which are enabling visualization, clash detection, and improved coordination from a technical standpoint. However, the impact on productivity has been limited. One of the key reasons is that early adopters of 3D modelling are engineering firms and architects, who do not have full control of construction costs and schedules. Here, again, the issue is not technology, but industry and project organisation. To continue the comparison with manufacturing, the adoption of 3D modelling in the auto industry has helped to design more complex cars, but the real productivity gains in the last two decades have been achieved with the onset of modular design, rationalization of supply chains, and optimization of processes on production sites. BIM is a critical concept, but to get the productivity gains that the industry is expecting, the only path is a paradigm shift in construction practices. The path for construction will be the same: BIM is a critical concept, but to get the productivity gains that the industry is expecting, the only path is a paradigm shift in construction practices. And this revolution can only be led by developers, builders and operators, who control costs, methodologies, and influence the supply chain. This revolution can only happen when technologies finally meet the specificities of the industry. Now we know that the construction industry is slow to adopt new technology because of its nature as a project-based and fragmented industry. We also understand that the adoption of BIM is good step towards digitization, but much more is required to really improve productivity as a whole for the industry. Here is some exciting news: we have reached a turning point in that a combination of technologies – 3D modelling, cloud technology, IOT, data analytics, and mobile technology – is in the process of disrupting the industry. Of all these technologies, mobile devices are displaying the single most significant impact. When I mention mobile devices, I am not referring to iPads or tablets. No, just the mobile device that you are more than likely carrying today. This is not about something complex like 3D models, either, but about something very simple, that everybody knows how to use on-site: a smartphone. It may be difficult for some to believe that this small, pervasive device can revolutionize the way that the construction industry operates. But remember: almost everyone has one, you probably already know how to use it, it is always with you, and almost always online as well. A smartphone helps people stay connected in their everyday lives, so why not also apply this concept to a construction team? Each worker can be equipped, at a low cost, and access information in real time. All processes can be digitized, quickly and easily. Spend a day on a construction site and you will be amazed by the incredible number of activities that need to be coordinated, and the time wasted because equipment, materials, or people are delayed or the time spent filling out paper forms for safety, quality or reporting purpose. Tasks, processes, people, assets… In a manufacturing environment, all of these activities are digitized with server/desktop-driven technology. On construction sites, processes are not standard, suppliers come and go, and carrying around a laptop is simply not practical. Mobile technology finally allows construction sites to replicate what has been done on manufacturing production sites over the last 20 years. Each worker can be equipped, at a low cost, and access information in real time. All processes can be digitized, quickly and easily. Without any need for paper forms, site management can be performed and updated in real time, from quality inspections to maintenance repair work, and from equipment tracking to safety processes. Information can be available to the whole team and stored on a secure server at all times. Now combine the new technologies with methodologies derived from the manufacturing world – lean construction, PPVC (Pre-fabricated, Pre-finished Volumetric Construction), site process optimization – and you have gathered all the ingredients for a paradigm shift in the industry: A shift that will impact productivity more significantly than anything done in the last two decades. It is worth mentioning that both the adoption of new standard processes and the adoption of new technologies are critical for success. One does not generate benefits without the other. The industry needs a powerful and sophisticated mobile enterprise platform, able to manage both standard and custom processes. To illustrate this point, in the last few years, countless mobile applications have been developed for the construction sector, but the vast majority fail to scale or provide tangible benefits because they forget one essential element: process optimisation. The industry needs a powerful and sophisticated mobile enterprise platform, able to manage both standard and custom processes. Likewise, many builders have commenced using new methodologies such as pre-cast or lean manufacturing, but the lack of powerful information systems and coordination tools on-site has negatively impacted the benefits of these new methodologies. Change will happen; it is just a matter of time. Essentially, the speed at which it happens will depend on how fast the industry will organise itself to leverage these new technologies, and on how fast technology will adapt to consider the specific nature of the industry. One thing is for sure: every company, every employee in the industry will be impacted, sooner or later. In this ever-shifting environment on the brink of significant innovation, it is worth asking: where do you stand?